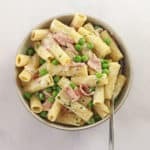 A delicious one pot Creamy Ham & Pea Pasta recipe, ready in just 15 minutes. Perfect for quick and easy mid-week meals! Add the pasta and stock cube to a large pan, cover with boiling water and cook according to the pasta package instructions. The stock cube helps to add some flavour to the pasta while it cooks. For the last 3 minutes of cooking, add some frozen peas to the pot. Then drain but retain a small cup of the pasta water for the sauce. Add in the cream cheese and add a splash of the retained pasta water. Mix until the cheese has melted and you get the right consistency of sauce. Add more pasta water if necessary. Add in the ham and garlic granules and mix again. Season to taste with salt and pepper and serve immediately with some green veg or salad.